Left to right: Dr. Clarence Chou, president of the AMA Foundation; Dr. Arshya Vahabzadeh of Emory University; Dr. Peter Carmel, a former president of the AMA. Photo courtesy of the AMA Foundation. Arshya Vahabzadeh, MD, has been named a recipient of the American Medical Association (AMA) Foundation’s 2013 Leadership Award. Vahabzadeh is a third year psychiatry resident in the Department of Psychiatry and Behavioral Sciences at Emory University School of Medicine. 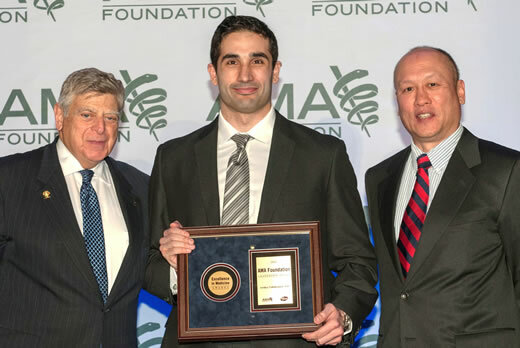 The AMA Foundation honored 20 individuals nationwide with Leadership Awards at its annual Excellence in Medicine Awards ceremony on February 11, in Washington D.C. The award provides medical students, residents, fellows and early career physicians from around the country with special training to develop their skills as future leaders in organized medicine and community affairs. Recipients of the award are recognized for demonstrating outstanding non-clinical leadership skills in advocacy, community service and education. Vahabzadeh is deeply interested in neurodevelopmental disorders including autism and schizophrenia. He founded the Residents Research Forum at Emory and - with the help of funding by The Autism Foundation of Georgia - has conducted research encompassing several areas of study including genetics, novel psychopharmacology, and social cognition. “This award reflects the tremendous mentorship and training that I have received at Emory. The incredible talent in psychiatry, neuroscience, and genetics has truly inspired me to strive for excellence,” says Vahabzadeh. His passion about advocating for better mental health resources has taken Vahabzadeh to the offices of Senators and Congressmen on Capitol Hill, where he has encouraged investment into mental health resources in the state of Georgia. Vahabzadeh is a recipient of both the American Psychiatric Association's Leadership Fellowship and the American College of Psychiatry's Laughlin Fellowship. He has published and presented over 40 papers, articles, posters, and book chapters since starting residency. He is currently the Associate Editor of the American Journal of Psychiatry Residents Journal, and is also a regular contributor to the APA HealthyMinds blog. Vahabzadeh is hoping to pursue a fellowship in child and adolescent psychiatry.